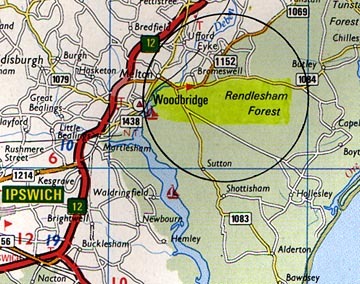 Joint British Royal Air Force and U. S. Air Force bases, Bentwaters (not shown) and Woodbridge, are about 3 miles apart with some of the Rendlesham Forest between them. December 9, 2002 - Twenty-two years ago on December 26, 1980, U. S. Air Force Staff Sergeant James Penniston was stationed in the 81st Security Police Squadron at the large joint British and U. S. Air Force base known as RAF (Royal Air Force) Bentwaters and its smaller, secondary base at Woodbridge, about three miles away, where some aircraft were kept. Not long after midnight on December 26, Sgt. Penniston was asked to investigate odd lights seen moving in the Rendlesham forest between Bentwaters and Woodbridge. Joining him was USAF Airman First Class John Burroughs and several other security and military personnel.